Unregistered users - start here! Would it be possible to add the black dot to threads you have posted in? GT Function wrote: Would it be possible to add the black dot to threads you have posted in? 2. If you've posted in them, they will be a bell with a black dot. 3. If you've not, they will be regular bells. That folks, is about as good as i can do. If anyone has any better ideas for the icons, do let me know. I could make them the same as the Awooga ones, or different. Just not quite sure what to do. I've gone with the new flat look in the end but I've made a few tweaks myself, removed a bit of space here and there, also removed the blue bar at the bottom, did away with bold thread titles as they were, well, too bold and made the brackets square for threads with multiple pages. Last edited by calmdown on 17 Sep 2015, 23:14, edited 1 time in total. calmdown, where in the script did you remove the space between posts, please. Look for this bit, it's the margin-bottom. I've set it to 1 pixel, can't remember what it was before. If anyone likes my look let me know and I can post the whole code for people to replace the latest one with. Last edited by calmdown on 17 Sep 2015, 18:26, edited 1 time in total. I wanted to tone down the thread titles a little, so changed them from bold to normal. but the odd few are still showing bold eg. the Lucy Collett thread was in bold, I clicked on the thread, yet it's still bold. And that seems to be the case even if I stick to having thread titles all bold. Any idea why that might be? In terms of that one thread, I often find that restarting the browser will do the trick as your browser cache's some items. Refreshing doesn't make any difference, just seems there are just some threads that always show up bold, whether I've viewed them or not. Even if I just install your latest flat look without any of my tweaks it still happens, some threads always remian bold, dunno if it's just a problem I have though. I've given that a go Trig and I think that pretty much fixes it. I still get the odd thread showing up as bold, however once I've clicked into the thread, they are no longer bold. So that's better. It seems though that if I've posted in the thread they remain bold no matter what. Maybe they're supposed to be like that though? Here are screenshots with your latest fix, both before and after I tweaked thread titles to normal. Gone for a solid circle (like Awooga) for an unread regular thread and a solid tick for an unread topic i've posted in. What you reckon? The bells were a bit small and the black dot was not that visible. Trigger wrote: Gone for a solid circle (like Awooga) for an unread regular thread and a solid tick for an unread topic i've posted in. What you reckon? Or how about instead of the tick, a white tick within the blue circle, or would that be too small? Not checked this for a while - like the flat look one although what do I need to change to make it fill the screen? Will wrote: Not checked this for a while - like the flat look one although what do I need to change to make it fill the screen? edit: good work, nice and clean, but the font type in the posts is a deal braker, is it arial or something? has anyone changed to anything better? well, if I zoom out by one factor - I guess this goes from 100% to 90% , everything looks way better. Is there any mod/edit I can make to make it zoom to 90% permanently? Any way of getting the little dot in thread you've replied to? Apologies if this has already been posted or asked before but is there any way to change the alternate colours of each post background in a thread? I'm colour blind and this set up is making it really difficult to distinguish stuff. Is this just me. In the last 48 hours, I have been getting no icons appearing in the edit / report / reply / quote boxes that show in each thread. I've been getting little bullet points instead of unread post markers on the forum front page, and ticks in view your posts. IS this the end of the world. Tell me straight. If you click here you can see it says updated 26 Oct, and there's an update available if you want it. Do you have automatic updates turned on in the addon laertes? calmdown wrote: If you click here you can see it says updated 26 Oct, and there's an update available if you want it. edit: Got it back the way it was now, dunno why that happened though. 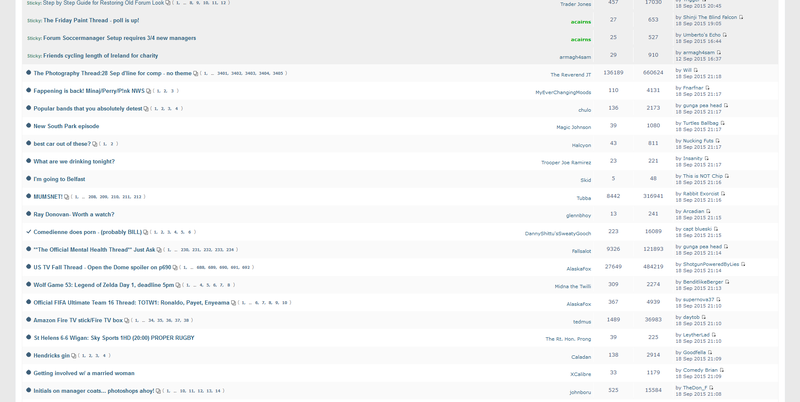 Laertes, the ticks are to show which threads you have posted in, blue dots are "unread" threads, and thread titles with no dots and an unbolded title are threads that have been read. mine is all weird, which one should i be using? thread has gone a bit unwieldy. any chance of editing the OP to reflect updates since August? I'd like to try this out. Alan Beads wrote: thread has gone a bit unwieldy. any chance of editing the OP to reflect updates since August? I'd like to try this out. I can't do that as I'm not the OP. However, if you use Firefox or Chrome, install an add on called Stylish. Click on "Trig's Flat Look" and click "install"
Is there a way to change the way links open from the forum? Currently, when I click a link, it opens in the current tab rather than a new tab. Maybe this is something in my chrome settings but I can't see it.